We have recently celebrated Easter and the Lord’s Ascension. The thought of the great mystery of the Ascension is still vivid in our minds. In addition to the glorification of Christ, what was the reason for this manifestation of Christ’s glory to the disciples? A time had just passed when their faith had all but failed, even while they had His pattern before their eyes; and a time, or rather a long period was in prospect, when heavier trials far were to come upon them, yet He was to be withdrawn. They hitherto understood not that suffering is the path to glory, and that none sit down upon Christ’s throne, who do not first overcome, as He overcame. He stayed to impress upon them this lesson, lest they should still misunderstand the Gospel, and fail a second time. The disciples had had great privilege being with Christ and now he was gone. They recalled his miracles, his parables and all his words and actions. 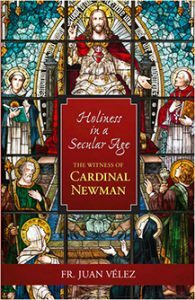 Newman compares the forty days before the Ascension to the forty years of the Jews in the desert. During this period Jesus trained his Apostles, and taught them to consider their treasure is in heaven. They mourned and wept” at the beginning of the season, but at the end they are full of courage for the good fight; their spirits mount high with their Lord, and when He is received out of their sight, and their own trial begins, “they return to Jerusalem with great joy, and are continually in the Temple, praising and blessing God. When facing difficulties and hardships we must remember Christ’s teaching that the way to heaven is through the cross, and that he who conquers will be called son of God. We should consider as Newman puts it that warfare is the condition of victory, that is, daily spiritual warfare. Christians “are tried, and then they triumph; they are humbled, and then are exalted; they overcome the world, and then they sit down on Christ’s throne.” In their writings the Apostles Peter, Paul and John teach us to partake in Christ’s sufferings that we may be glorified with him. We are each called to “this necessary work” and like the martyrs and confessors ‘to play the man.’ All of heaven is looking on: we must be brave and bold, and do our part. O let not your foot slip, or your eye be false, or your ear dull, or your attention flagging! Be not dispirited; be not afraid; keep a good heart; be bold; draw not back;—you will be carried through. Whatever troubles come on you, of mind, body, or estate; from within or from without; from chance or from intent; from friends or foes;—what ever your trouble be, though you be lonely, O children of a heavenly Father, be not afraid! quit you like men in your day; and when it is over, Christ will receive you to Himself, and your heart shall rejoice, and your joy no man taketh from you. Jesus Christ reigns at the right hand of the Father. “He has entered into his rest.” And he is surrounded by the angels and martyrs who praise him day and night. You and I, will we fight the good fight? Will we press on with good hearts? Sustained by the heavenly manna and guided by the Holy Spirit we will conquer in the daily battles; we will “make every effort to enter that rest” (Heb 4:11) and thus “approach the throne of grace” (v. 16).